B lymphocytes express relatively high levels of TIM-1. (A) Representative flow cytometry plots showing TIM-1 expression on splenic CD4+ and CD8+ T cells and CD19+ B cells in naive BALB/c mice or at 14 days after immunization with either allogeneic (B6) islet transplantation (Txpl) or OVA (20 μg with 4 mg alum i.p. on days 0 and 7). Cell staining was performed in the presence of anti-CD16/CD32 to block FcR binding, and isotype- and fluorochrome-matched negative controls were used to set the cursors. Isotype control staining for CD19+ cells is shown at right. n ≥ 3 per group. 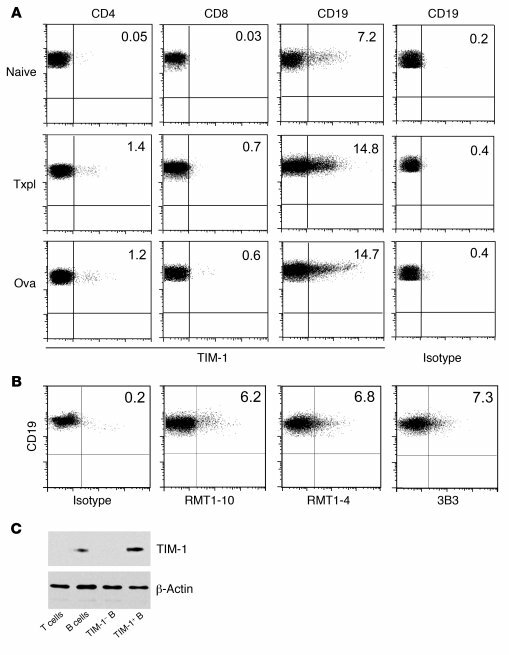 (B) Representative flow cytometry plots showing TIM-1 expression on CD19+ B cells from naive mice assessed by indirect staining with anti–TIM-1 mAbs RMT1-10, RMT1-4, and 3B3 followed by PE-conjugated anti-rat Ig secondary mAb. n = 3 per group. (C) Anti–TIM-1 immunoblot of cell lysates from sort-purified T cells, B cells, TIM-1+ B cells, and TIM-1– B cells. Representative of 2 independent experiments. Numbers denote percent TIM-1+ cells within each population.